You need only read daily news stories to understand the challenges and threats that data breaches now pose for business. Once a breach occurs, millions of dollars can easily be lost to fines, penalties, attorney fees, remediation expenses, lost customers and harm to reputation, trust and confidence. It’s not just a problem for certain types or sizes of business — today, all industries and all organizational sizes are being affected. Companies spend significant money on IT solutions establishing a layered set of Internal Controls to manage threats of the business’ vulnerability or ‘Actual Threat Environment™’ (ATE) is broader than these Internal Controls. Unfortunately, because the threat environment is so dynamic, a significant ‘gap’ between Actual Threat Environment™ and Internal Controls has become the norm for business. 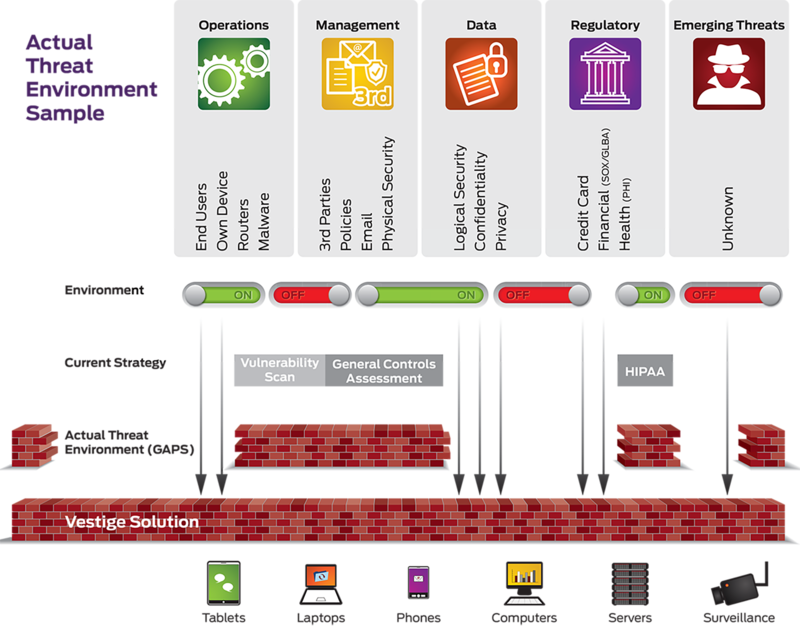 An organization’s Actual Threat Environment™ reflects the entire scope of risk and its complexity: business strategies, underlying electronic devices, network configurations, security, policies, persons, companies, relationships, case law, and regulatory environment within which the organization operates. Together all of these components comprise a modern business/legal/technical/social environment and need to be considered when evaluating risks to an organization’s Actual Risk Environment. The only way in which an organization can effectively and competently manage the risk of data breach is to maintain internal controls that match its Actual Threat Environment™. Anything less — including being merely compliant with applicable regulations — invites a false send of security and insures that eventually, the business will need to deal with a data breach. The latest research by Ponemon Institute, Verizon and other shows that the threats not addressed by typical internal controls are leading causes of data breaches, including contractor negligence, third party mistakes and employee errors. 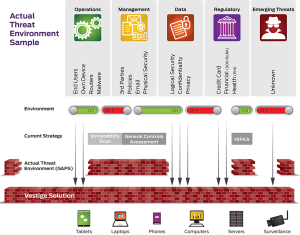 Within this Actual Threat Environment™, Vestige’s holistic approach to data protection addresses all these risk factors and extends the analysis beyond any single department and any single area of focus. For more than a decade Vestige has worked closely with Fortune 1000 companies, major law firms and insurance companies to prevent and remediate data breaches. Our forensic and legally trained experts conduct investigations and forensic analysis, and provide Expert testimony regarding the cause/sources of data breaches. This experience has given us an unique blend of investigatory, IT, networking, law, forensics, and testifying capabilities necessary to provide data breach prevention solutions that provide an organization with meaningful and strategically sophisticated gap analysis between Internal Controls and their Actual Threat Environment™. Leverages our Deep Investigative Knowledge gained through our experience in helping organizations recover from ‘What’s actually happening in the real world’. Actionable, easy-to-understand, prioritized recommendations to increase the security of your entire IT ecosystem. The result is the only complete assessment that identifies an organization’s Actual Threat Environment™, compares it to the organization’s Internal Controls (including all controls in place to comply with applicable regulations, such as SOX, GLBA, HIPPA, PCI, etc. ), and provides a gap analysis needed to effectively understand and manage the risk of data breach within the organization’s real world Actual Threat Environment™. Vestige Digital Investigations offers clients several data breach prevention services to choose from primarily based upon the level of validation they wish to achieve surrounding their Actual Risk Environment™ and operating Internal Controls. Contact Us today to discuss how Vestige can assist with your CyberSecurity Assessment needs.